Orbital ATK's uncrewed Cygnus cargo spacecraft sits atop a United Launch Alliance Atlas V rocket at Cape Canaveral Air Force Station in Florida ahead of a planned Dec. 3, 2015 liftoff. The first launch of the private Cygnus cargo spacecraft since an October 2014 rocket explosion aims to deliver a wealth of science equipment and experiments to the International Space Station. The uncrewed Cygnus, which is built by the aerospace company Orbital ATK, is scheduled to blast off Thursday (Dec. 3) at 5:55 p.m. EST (2255 GMT) atop a United Launch Alliance Atlas V rocket from Florida's Cape Canaveral Air Force Station. You can watch the broadcast of the launch here on Space.com, courtesy of NASA TV. Thursday's launch kicks off the fourth uncrewed Cygnus mission to the space station that Orbital is flying under a $1.9 billion NASA contract. This latest mission is quite science-heavy, featuring payloads such as the locker-size Space Automated Bioproduct Lab (SABL). The SABL, which features a temperature-controlled chamber, will support all kinds of research, ranging from commercial applications to opportunities for students to do research on the International Space Station (ISS), NASA officials said. The facility can house experiments that can run passively or actively, controlled by a remote operations center. The lab also includes sensors and high-definition video to record experiments as they are performed. The Packed Bed Reactor Experiment, which is scheduled to launch toward the International Space Station aboard Orbital ATK's Cygnus cargo spacecraft on Dec. 3, 2015. Cygnus will also tote the Packed Bed Reactor Experiment (PBRE), which will study how gases and liquids behave in microgravity when they move through porous material. This research has applications for systems such as reactors, scrubbers and strippers, NASA officials said. Although packed bed reactors for water recovery and fuel cells on the space station can use either liquid or gas right now, no existing system can handle both at the moment. Other experiments include an investigation into how well a variety of flame-retardant textiles fare in space, and two satellites that will demonstrate networking between machines. 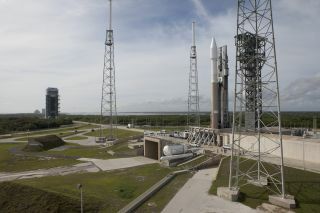 There's a 60 percent chance that weather conditions will be favorable for Thursday's launch, U.S. Air Force officials have said. Orbital ATK isn't the only company with a NASA deal to resupply the ISS. SpaceX has flown six successful missions to the orbiting lab using its uncrewed Dragon cargo capsule and Falcon 9 rocket under its own $1.6 billion contract; the seventh ended less than three minutes after liftoff when the Falcon 9 broke apart this past June.